Fortunately, the field had turned to soft mud after all the rain, and aviator Wiseman emerged muddy but uninjured from the plane, now nose down. Most important, he made good on his money back guarantee “to fly.” The plane was repaired in time to fly again in Olympia on May 18th with Snohomish’s “Bird Man” at the controls. 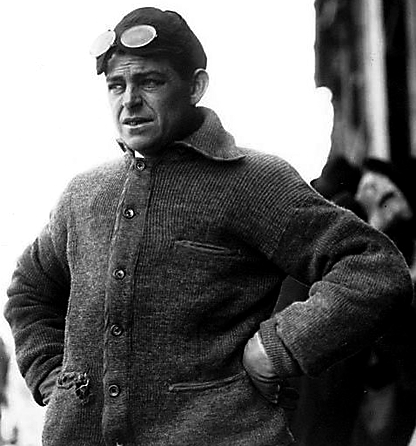 Earlier in the same year, Wiseman carried mail with him on a flight from Petaluma to Santa Rosa, California, which was eventually recognized as the first to carry airmail in U. S. history. Today the restored aircraft hangs in the atrium of the Smithsonian’s Postal Museum in Washington D. C.
Nor are we disappointed today. The photographic record of the event provided by William Douglas is a gift of memory. 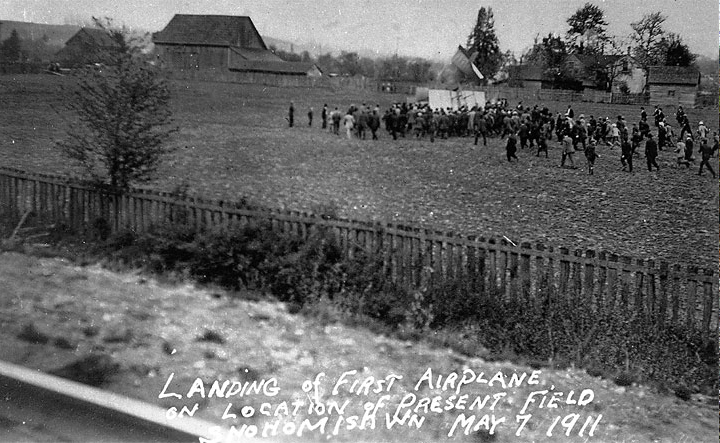 Save the Date: Wednesday, July 20th, this summer, as part of the Kla Ha Ya Festival — David Dilgard’s slide show talk on the First Airplane Flight in Snohomish, at the Harvey Airfield Community Room as part of an exhibition marking 100 Years of Flight in Snohomish. Photographer William Douglas must have run down the railroad tracks to capture this image — note the rail in the bottom left of the frame. We imagine that he was using one of the cameras designed for the postcard format. Kodak’s model 3A was introduced in 1903 and sold until 1915. The 3A created 3 1/4 x 5 1/2 inch postcard format images on Kodak 122 roll film, and the film came in four, six and ten exposure lengths. This raises the interesting question that perhaps other images were captured by Douglas on that day? Photograph by William Douglas, courtesy Donna Harvey and the Snohomish Historical Society Archives. The author, on the other hand, uses a digital Sony DSLR-A100 to capture the repeat images. The flash memory will capture over 50 exposures in the RAW format and at over 50 inches wide! 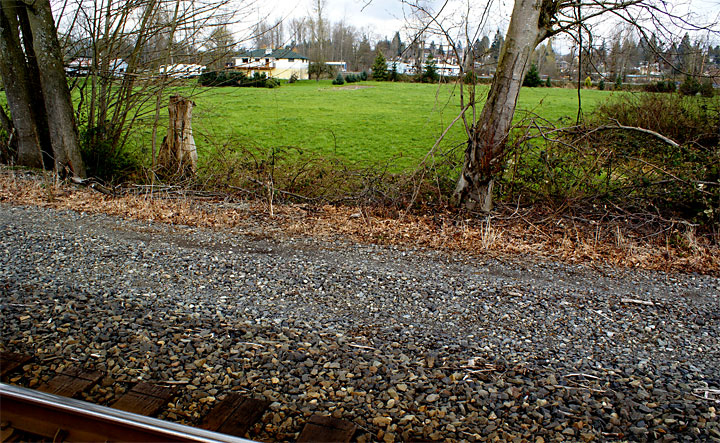 The John S. Bateman farm is gone as far as could be discovered. This open field and buildings beyond borders along side State Route 9. Published April 20, 2011 in the Snohomish County Tribune.